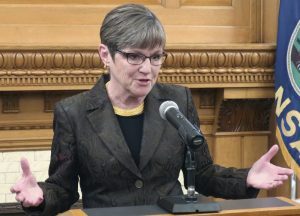 TOPEKA, Kan. — Kansas’ new Democratic governor on Monday vetoed a tax relief bill approved by the Republican-controlled Legislature, arguing it would repeat an infamous fiscal experiment that failed under a Republican predecessor. Top Republicans immediately condemned Gov. Laura Kelly’s action as allowing an “unlegislated tax increase” and hurting the state’s economy. The measure was aimed at preventing individuals and businesses from paying more in state income taxes because of changes in federal tax laws at the end of 2017. A clash between Kelly and Republican leaders was inevitable. Allowing the tax relief to become law would have undermined the state’s ability to sustain Kelly’s proposals for education funding and Medicaid expansion. Republican leaders have yet to muster the two-thirds majorities necessary to override a veto and enact the tax bill, so Kelly is likely to prevail. Top Republicans said by allowing an “unlegislated tax increase,” Kelly broke a campaign promise she made repeatedly last year not to raise taxes while helping public schools, expanding Medicaid and stabilizing the state budget. Her GOP opponent, former Kansas Secretary of State Kris Kobach, made returning the tax “windfall” among his key issues. Top Republicans also that the issue was akin to deciding whether to return a lost wallet full of cash after finding it on the sidewalk with the owner’s ID inside. “She kept the money — she kept the money for herself,” said House Majority Leader Dan Hawkins, another conservative Wichita Republicans. Kelly’s administration projected that under the bill, taxpayers would save $209 million during the state budget year beginning in July. The bill vetoed by Kelly would have provided relief to taxpayers who have itemized on their state returns. It would have allowed them to keep itemizing even if they don’t on their federal returns, something previously prohibited. Republican legislators also attached a provision to lower the state’s sales tax on groceries to 5.5 percent to 6.5 percent to make the bill harder for Kelly to veto. Kelly herself promised during her campaign last year to work to lower the tax. Kelly said she remains open to considering limited changes in tax laws that help working families if they’re offset by other changes that keep the package from lessening the state’s revenues.